It is the mission of the Colton Fire Department to protect life, property, and the environment in order to preserve and improve the quality of life of those we serve. The Fire Department will provide comprehensive emergency services to our citizens, visitors, and employees. We will cultivate leaders at all levels of the Department through education, training, and high ethical standards. We will treat others as we would want to be treated. These are the core values we have chosen to hold which form the foundation on which we perform work and conduct ourselves. These values underlie our work, how we interact with each other, and which strategies we employ to fulfill our mission. They are the practices we use every day in everything we do. Welcome to the Colton Fire Department’s (CFD) website. It is my honor to serve the citizens of Colton as their Fire Chief. Our vision and core values reflect on what we want to be and what we value. Each of our firefighters and staff strive to serve our community to the best of our abilities. We realize that every shift we interact with our residents and visitors in some of their greatest times of need; this is a humbling honor we do not take for granted. The Colton Fire Department (CFD) was formed on November 21, 1889 and currently serves a population of 54,828 people in the 16-square mile city out of four strategically located fire stations. There are currently 41 full-time firefighters, one Executive Assistant, two volunteers, and one contract Physician Medical Director who staff the department. In 2018 the department responded to over 7,200 calls for service dispatched through the Confire Joint Powers Agency Dispatch. CFD deploys three Type-I engines and a Truck that each are staffed by one Captain, one Engineer, and one Firefighter Paramedic; one Battalion Chief is on-duty per day and one Fire Marshal. Colton has provided Paramedic Advanced Life Support to its citizens as one of the first paramedic providers in San Bernardino County since July 1975. 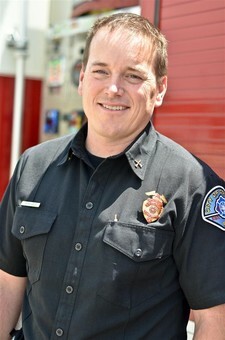 Colton Fire is a thriving Department with a rich culture that goes back more than 125 years. We are active partners with surrounding communities and respond as part of a robust mutual aid system. Over the past few years we have seen many retirements and have recruited new Firefighters, promoted new Engineers and Captains, and are currently preparing to promote a new Battalion Chief. These new recruits and promotions represent an exciting time for CFD as we introduce new faces and innovations to our Department. Our Fire Marshal has been busy over the last year assuring that inspections, plan checks, and other prevention activities are completed in a time of increased growth and construction in Colton. Disaster Preparedness, grants, and Community Emergency Response Teams are an on-going focus. The Fire Explorer Program is a priority for us and we to try to hire from those ranks. We continue to work jointly with the Loma Linda Fire Department, sharing Command Staff resources. The Fire Department is in process of implementing industry best practices for cancer prevention of our firefighters. This includes particulate resistant flash hoods, second sets of turnouts, extractor washing machines, and other engineering practices. We have a new grant funded fire engine ready to be delivered. Staff will be writing a new Strategic Plan this year, and we look forward to planning our path forward over the next five years. Colton Fire Department will continue to function as a partner with our community and we look forward to maintaining exceptional service to our residents, visitors, and neighbors. Please feel free to call with any questions or concerns at 909-370-5100. City of Colton Fire shared a post. City of Colton Fire is with Frank Navarro. City of Colton Fire shared a photo. Colton Fire Department had the privilege to participated in a multi-agency Mass Casualty Drill at Arrowhead Springs Resort in San Bernardino today. The drill simulated a large scale earthquake at an outside venue with multiple injuries. Drills such as these allow crews to hone their skill and work closely with cooperators. City of Colton Fire is in Colton, California. Congratulations to Henry Perez on his promotion to Battalion Chief. He will be taking the command of B-shift in just a few days. A-shift will surely miss you and your leadership. Our entire organization is excited for what's to come. We couldn't be happier for you. Congrats Chief Perez! Assemblymember Eloise Reyes secured State funding to purchase a new Type-III Brush Engine for the City of Colton in July 2017. BE214 will serve the inter-face areas of Reche Canyon and La Loma Hills along with being available to provide mutual aid up and down the state. The new engine was presented to City Council on Tuesday night. As a token of the Fire Department’s appreciation, the Assemblymember was presented a Colton Fire Department Challenge Coin. Thank you Assemblymember Reyes for your support of the City of Colton. Happy Saint Patrick's Day! Enjoy & Stay Safe. Awesome tribute from Cal Fire.